Welcome To Dom's Butcher Block, Ellicottville's NEWEST Establishment! 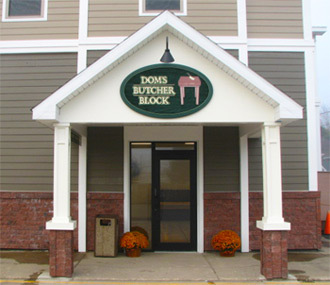 At Dom's Butcher Block our specialty is fresh cut meats processed in house daily. We carry USDA Choice beef and USDA Prime on request. No prepackaged or frozen beef cuts to be had at our store - Only the freshest cuts and only the best cuts! When you come in the door, everything you see in our case was cut fresh today and we can custom cut specific requests for your special needs. We custom craft a variety of smoked meats including bologna, pepper sticks, beef jerky and various smoked sausages. All of our smoked meats are made using time tested old fashioned techniques right on the premises. If you like sausage, well it doesn’t get any better than our fresh homemade sausage: Hot, Mild, or Maple flavored breakfast sausage available daily and other varieties available are being created all the time. Other special items we carry include free range chicken and fresh rack of Lamb and center cut lamb chops. Whole lamb legs available upon request. If you need organic beef, prepackaged organic beef is also available upon request. If you need quality fresh seafood, we have fresh fish available every Friday for your weekend plans. On top of all our great meat products, we carry a full line of Cuba cheese. Can’t find just what you need or want something special for that large party or event? We can help stop in, call or email and we’ll be glad to help you!